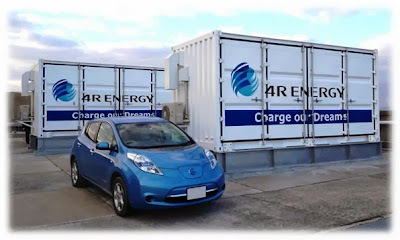 Japanese Firm Sumitomo Corporation has developed and installed the world’s first large-scale power storage system which utilizes used batteries collected from electric vehicles. This commercial scale storage system, built on Yume-shima Island, Osaka, will begin operating in February 2014. Over the next three years, the system will measure the smoothing effect of energy output fluctuation from the nearby “Hikari-no-mori,” solar farm, and will aim to establish a large-scale power storage technology by safely and effectively utilizing the huge quantities of discarded used EV batteries which will become available in the future. This project has been selected as a model project for "Verification of the battery storage control to promote renewable energy" for the fiscal year 2013 by the Ministry of the Environment of Japan. Nissan and Sumitomo Corporation created the joint venture company, “4R Energy Corporation”, in September 2010, to address the secondary use of EV lithium-ion batteries. The used EV batteries that will be recycled into this large-scale storage system have been recovered and have gone through thorough inspection and maintenance at 4R, to confirm safety and performance. This prototype system (600kW/400kWh) consists of sixteen used EV batteries. Sumitomo will seek new business opportunities which can make use of the highly economical storage system, as well as work on developing new applications for used EV batteries. The company aims to actively promote this approach, which can both contribute to expanding the use of EV and encourage the use of renewable energy. Sumitomo is committed to the movement toward lowering the carbon footprint of a sustainable society.